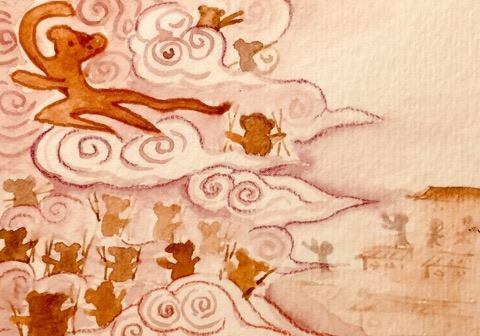 When we left our story last, Sun Wukong had just defeated the Monstrous King of Havoc, rescued all the little monkeys who had been captured, and brought them safely back to Mount Hua Guo! Wukong thought to himself: If next time a monster comes to bully my monkeys, they’ll have to learn how to defend themselves! Right then! I will teach them some Kungfu! Thus, the Monkey King ordered the monkeys to make bamboo spears and wooden blades. The monkeys were excited too! Before long, each was holding a wooden weapon. The Monkey King cried, and he was off! Wow! Row after row of weapons, too many to be counted! Again, Wukong pulled out a big handful of hairs, and called “change”: and the hairs became hundreds of little Wukongs! They immediately leapt forth and began to grab weapons! The stronger ones carried six to seven, those less strong carried two to three. In a blink of an eye, they had emptied the armory! “Weapons, where are are weapons?! Ahhh!" But by now, Wukong had already taken the weapons, and had vanished without a trace! Hi Panda Cubs, we end our story here for today. Now, some of our panda cubs might ask: “Was Wukong right to do what he did?” What do you think? As for what happened next, we will continue our story, next time!